More jobs don't necessarily mean more growth. In January 2008, U.S. jobs peaked at 138,365,000. In the next two years, the economy tumbled, losing almost 10 million workers. We've been climbing Jobs Mountain to get back to January 2008 ever since. Today, we reached the summit. The economy added 217,000 jobs in May—with the unemployment rate unchanged at 6.3 percent—setting a new all-time record. It only took 2,312 days. This also marked the 51st consecutive month of private-sector job growth, matching the longest run ever from February 1996 to April 2000. That's the record we should be more proud of. 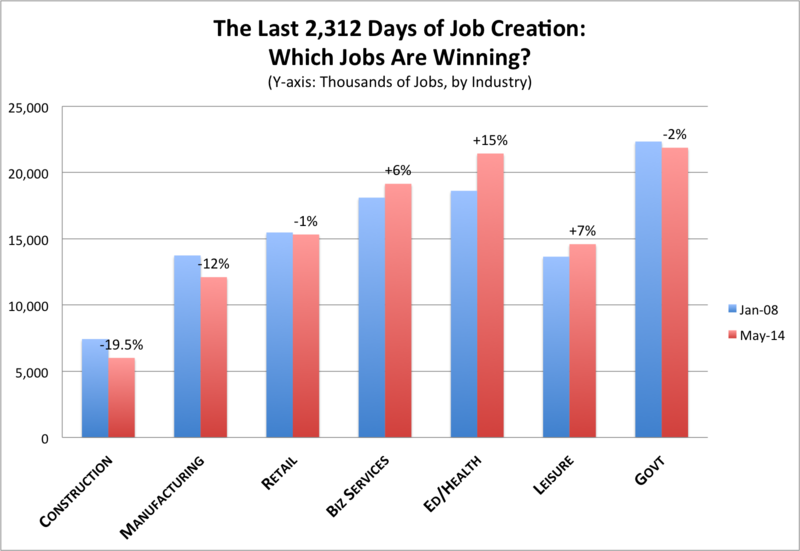 This is what the longest jobs recovery in American history looks like. Don't pop the champagne just yet will be the refrain heard across websites, newspapers, and cable news today. And, for once, the websites, newspapers, and cable news channels will all be right. Even though we've tied our all-time record for most jobs ever, quite a lot changed in the 2,312 days since January 1, 2008. Most importantly, the working-age population grew by 15 million. As a result, the percent of the country that has a job has fallen steeply, from 62.6 percent to 58.9 percent. Our labor force participation rate—a separate measure of the share of Americans working or looking for a job—has fallen as well, and now sits at a multi-decade low. So there are two ways of looking at this news: (1) We set a jobs record, hooray! and (2) Despite adding the combined populations of Massachusetts and Virginia in the last six years, we don't have any more jobs than we did in January 2008. 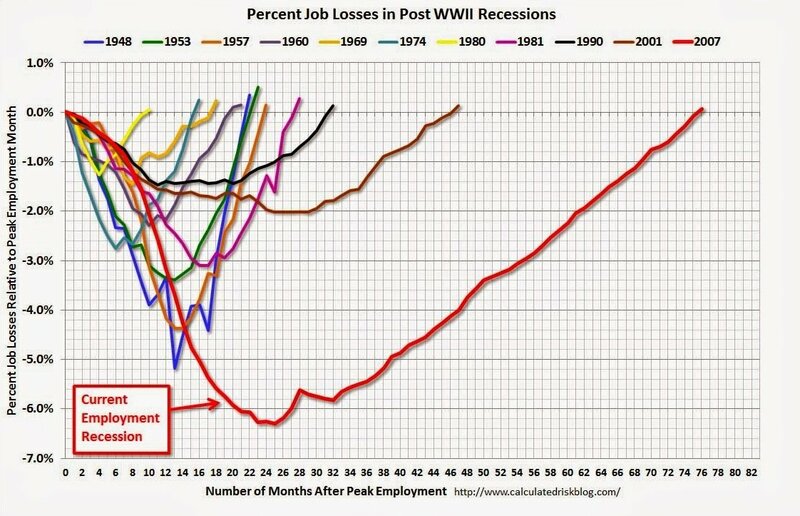 Even though we've "recovered all the jobs we lost," we haven't actually recovered all the jobs we lost. We've reached the old peak with a new mix of jobs. Compared with January 2008, manufacturing jobs are still down 19.5%. Meanwhile, education and health jobs are up 15%. Here's a sector-by-sector breakdown of the peak-to-peak change. The one thing that hasn’t changed in the last six years is the education gap. Six years ago, college grads were 70 percent more likely to be in the labor force than high-school dropouts. Today, college grads are … 70 percent more likely to be in the labor force than high-school dropouts.